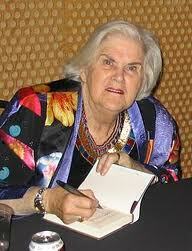 Anne McCaffrey, author of nearly 100 books, co-author of more than 30 and best known for the Dragonriders of Pern series, died on Monday at her home in Ireland. She was 85. McCaffrey was the first woman to win a Hugo Award (in 1968) and the first woman to win a Nebula (in 1969). She was the daughter of an army colonel, was born in Cambridge, Mass., and grew up in Montclair, N.J. She was inducted into the Science Fiction Hall of Fame in 2006. I'm not a huge Fantasy fan, but I read all of the Dragon Riders of Pern series. When I first became a bookseller, almost eleven years ago, I asked one of the booksellers who lived and breathed Fantasy, to recommend something for me to read. I think booksellers should be widely read and this series is really good. I since have read a few more fantasy series, thanks to this positive experience.